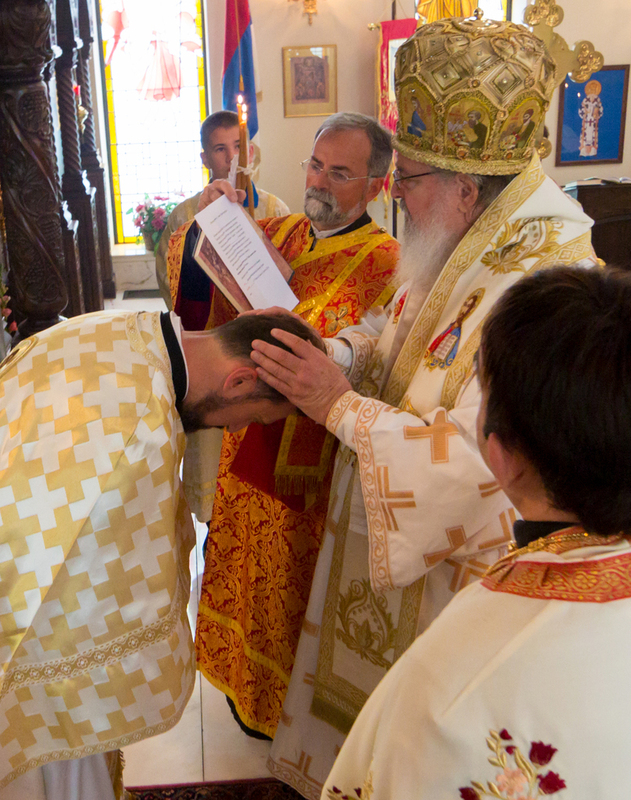 Omaha, NE - With its centennial anniversary in sight, St. Nicholas Serbian Orthodox Church, Omaha, Nebraska, celebrated its ninety-eighth Slava on Sunday, May 17, 2015. This particular Slava observance will go down in the annals of St. Nicholas Church for several reasons, most notably for the magnanimous presence of His Grace, Bishop Sava, who with great personal sacrifice rearranged his schedule in order to visit the Omaha colony. Due to Sabor (Assembly of Bishops) which takes place every year during a month of May, in the Serbian capitol Belgrade, St. Nicholas Church in Omaha rarely has the honor of hosting its Bishop for its Church Slava - the Transfer Relics of St. Nicholas (May 22nd) Our Diocese, however, has been blessed by the presence of retired Bishop Sava, who now resides at New Gračanitca Monastery, and acts as Bishop Longin's extended arm by serving and visiting parishes within our vast Diocese. An extraordinarily humble and spiritual man, Bishop Sava graced the weekend with his Christ-like love and encouraging words, winning the hearts of parishioners and inspiring them to greater faithfulness to the Church. 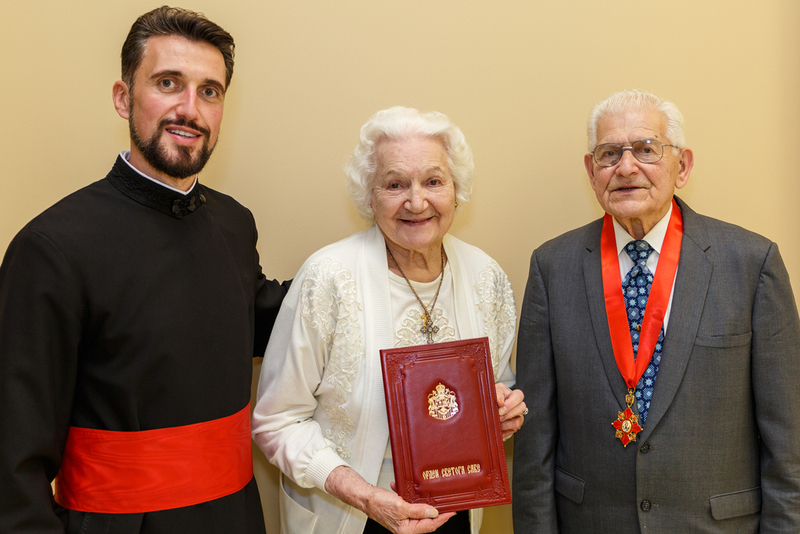 The primary reason for His Grace Bishop Sava’s visit was to bestow a Meal of St. Sava of the Second Degree upon Mrs. Ann Fatovich and her brother, Mr. Eli Mesic, both of whom have given an entire lifetime of selfless service and untold support for the Church in Omaha. The Medal of St. Sava is the highest honor bestowed by the Holy Synod of the Serbian Orthodox Church. Most recently, Ann and Eli made a remarkably generous donation of $200,000 to St. Nicholas Church, which has been set aside for the purchase of a needed parish home. The parishioners of St. Nicholas are deeply grateful to Ann and Eli, who have truly set before them an exemplary model of stewardship. The presence of His Grace Bishop Sava also occasioned a somewhat unexpected surprise, namely the elevation of St. Nicholas Church’s parish priest, Rev. Fr. Saša Petrović, to the office of proto-presbyter (protojerej), for which the parish cries Axios! and sings Mnogaja Ljeta! Fr. Saša’s leadership continues to sustain St. Nicholas Church through the many challenges facing Christians in today’s world. 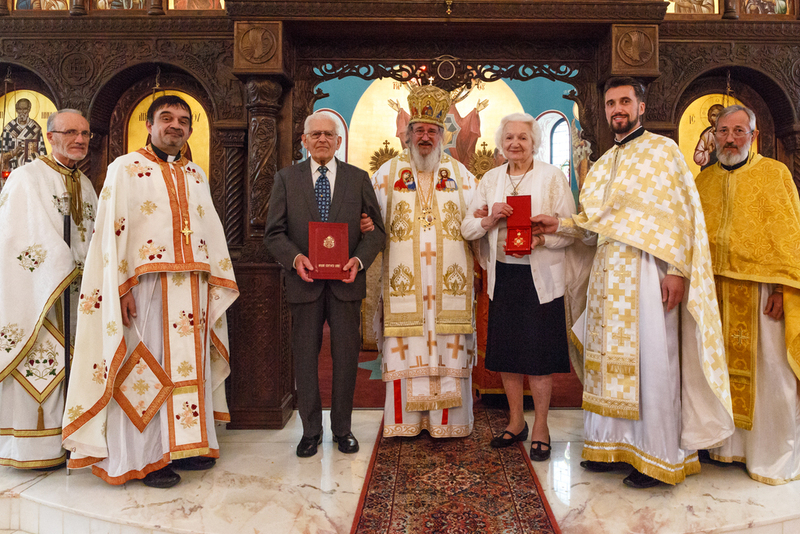 Honored kumovi for this year’s Slava are Mr. and Mrs. Metro and Marion Sasich, celebrated for their many, many decades of service to the Church and its choir. Metro (who unfortunately could not attend due to health reasons) and Marion have both served in leadership positions in various capacities over many years. Finally, besides His Grace Bishop Sava, honored guests included Reverend Father Zoran Milinkovic, a newly appointed priest at St. Demetrious Serbian Orthodox Church in Des Moines, Iowa, with his Protinica Ksenija, V. Rev. Stavrofor Aleksandar Bugarin from KC with his Protinica Gordana , Rev. Fr. Alexander Lukashonak and Presbytera Oksana, R. Fr. Elias Warren and Presbytera Rose of Omaha, and a very special guest V. Rev. Proto-Deacon Milovan Gogich who beautified the Liturgy with his lovely voice. Both Bishop Sava and Proto-deacon Milovan were amazed by the beauty of St. Nicholas Church , which lies like a hidden jewel in the heart of Midwest, and it is the only traditionally built Orthodox Church in the entire state of Nebraska. St. Nicholas Church in Omaha, is grateful to His Grace Bishop Sava for his pastoral presence, to Fr. Saša and Protinica Marija for their leadership, and to all its dedicated and gifted stewards as it prepares to enter into its second century, through the prayers of St. Nicholas and to the glory of the Triune God.